Vox Dot Com is a website comprised of smart thinkers asking tough questions and creating optimized data-driven content sponsored by some of America's most noble corporations, such as Walmart and Goldman Sachs. The website is part of Vox Media, which has attracted hundreds of millions of dollars worth of seed capital and investments from large media firms such as Comcast (Market cap: $140 billion) , the awful cable monopoly everyone hates and the parent company of NBCUniversal. Earlier this week, Vox (and content sponsor Discover Financial) sought to explain "your high cable bill," and in doing so defended Comcast's practice of offering massive cable bundles with tons of shows you don't want, as opposed to à-la-carte pricing, writing that, thanks to Comcast and its massive corporate clout, customers are actually saving money and should be grateful. "You could have been paying a lot, lot more," writes Todd VanDerWerff. 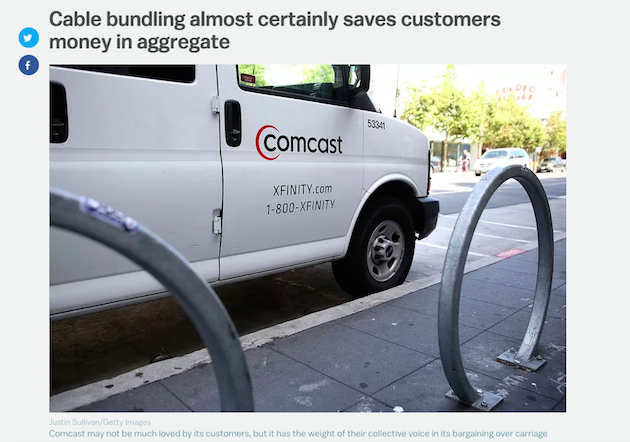 "Comcast may not be much loved by its customers, but it has the weight of their collective voice in its bargaining over carriage," the photo captions reads. Only after some readers criticized Vox for failing to disclose its financial relationship with Comcast did the website add a (barely perceptible) footnote to the piece. Vox Dot Com was launched with financial support from General Electric, another huge corporation that would benefit immensely if Vox Dot Com staffers were in charge of U.S. energy policy. Vox Media also has a friendly relationship with Microsoft, another Vox sponsor. The company's founder, Bill Gates, once "guest edited" Vox Media's technology affiliate The Verge without disclosing any conflict of interest related to coverage of Microsoft products. Vox Dot Com has written favorably about the Bill & Melinda Gates Foundation, which owns a significant stake in Comcast. This entry was posted in Politics and tagged Comcast, Ezra Klein, NBC. Bookmark the permalink.